Harumafuji to retire to take blame for assault on Takanoiwa. Discussion in 'Sports' started by Swami, Nov 29, 2017. Sumo grand champion Harumafuji has said he will retire from the sport, in a scandal that has rocked Japan's highly ceremonial sport. Harumafuji is being investigated for an alleged assault on a junior wrestler, with his palms, fists and a remote control, Japanese media said. The 33-year old Mongolian has since apologised for "causing trouble". Japan's sumo world has been hit by scandals involving violence, mafia links and match fixing in recent years. Harumafuji started his career in Japan at the age of 16 and was promoted to grand champion or yokozuna - sumo's highest rank - in 2012. How does sumo wrestling work? Harumafuji's apology came after local media reported he had beaten junior wrestler Takanoiwa during a drinking session with other wrestlers. Takanoiwa had to be hospitalised after suffering a concussion and a fractured skull base in the incident, local media reported. A spokesperson for Japan's Sumo Association (JSA) said Harumafuji's coach Isegahama had told the JSA on Wednesday of the wrestler's decision to quit. At a Monday press conference, a speaker for an advisory body to the JSA had said the case required "extremely harsh punishment" but that no final decision had been made yet. "There is almost no doubting that an act of violence was carried out," he said. The incident follows a string of similar scandals and reports of violence. In 2016, a wrestler and his coach had to pay nearly $300,000 (£230,000) to a fellow fighter they allegedly abused so badly he lost sight in one eye, according to reports. Thirteen senior wrestlers were implicated in a match fixing scandal in 2011 while a year earlier, the sport was rocked by alleged links between sumo wrestlers and the mafia-like yakuza crime syndicates. Another Mongolian grand champion retired from the sport in 2010 after reports of his involvement in a drunken brawl. In 2007, a teenage novice died after he was beaten up by older wrestlers in a case exposing a culture of bullying and hazing within the traditional sport's strict hierarchy. Grand champion Harumafuji has decided to retire as a sumo wrestler to take responsibility for his assault on a lower-ranked wrestler, his stablemaster, Isegahama, said Wednesday. 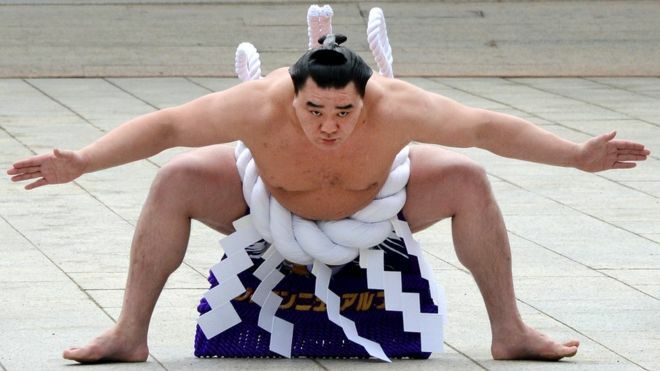 Isegahama has reportedly filed the Mongolian yokozuna’s letter of resignation with the Japan Sumo Association. He said Harumafuji will hold a press conference at 2 p.m. Wednesday. Isegahama said that Harumafuji “has caused great trouble to the association and the public” and that the yokozuna bears grave responsibility. Harumafuji, 33, has admitted to assaulting his compatriot, Takanoiwa, 27, during a drinking event at a restaurant-bar in the city of Tottori during a regional tour in late October, investigative sources said. Takanoiwa missed the Kyushu Grand Sumo Tournament that ended Sunday after being diagnosed with head injuries, including a suspected fracture at the base of his skull and a cerebrospinal fluid leak. Not surprising. Sad to see a career in sumo end like this, especially from a yokozuna ranked wrestler. Grand champion Harumafuji put an end to his 17-year sumo career on Wednesday after admitting to injuring a lower-ranked wrestler in an alcohol-fueled assault. The Mongolian yokozuna -- speaking next to his stablemaster Isegahama who could not hold back tears -- said in a press conference held in Fukuoka he was retiring to take responsibility and avoid damaging the reputation of a top-ranked wrestler. "I take responsibility as a yokozuna for injuring Takanoiwa and hereby announce my retirement. I offer my apologies to the Japanese people, the Japan Sumo Association and all those who supported me," Harumafuji said before taking a long bow. Harumafuji revealed that he was trying to fulfill his off-the-ring duty by teaching his junior disciple manners but he "took things a bit too far" when he hit the 27-year-old Takanoiwa. Harumafuji is said to have struck the eighth-ranked maegashira during a drinking event at a restaurant-bar in the western Japan city of Tottori during a regional tour in late October. It was initially reported he used a beer bottle, but sources said Harumafuji told Tottori police that he used his palms, fists and a karaoke machine remote control. "I did it for his sake. I wanted to teach him courtesy and civility. I scolded him out of my obligation as a senior wrestler but I hurt him and the sumo association, the fans and my support group," he said. "I have never been told I have a drinking problem. This incident did not happen because I had had alcohol." Separate sources said Harumafuji was angered by Takanoiwa attempting to use his smartphone while being scolded for his behavior by yokozuna Hakuho, who was also at the scene. Police have questioned Harumafuji on a voluntary basis as well as others, including Hakuho. Harumafuji could be referred to prosecutors by the end of the year on suspicion of assault, according to the investigative sources. Harumafuji said Takanoiwa, came to apologize to him the day after the incident and the two shook hands, so he was surprised when he discovered it had turned into a scandal. Still, the 33-year-old did not make excuses and explained why he waited to speak out. "As a yokozuna I did something I should not have. I hurt Takanoiwa. I wanted to wait till the end of the basho to make the announcement," he said. The JSA accepted his resignation letter filed by Isegahama Wednesday morning, and Harumafuji wrapped up the half hour press conference by reflecting on his successful career that came to a bitter end. "Ever since I crossed the sea at the age of 16, oyakata (stablemaster) and okamisan (stablemaster's wife) took me under their guidance and taught me not to get in people's way. I will always remember that," he said. "I love the country of Japan and the people of Japan. I must say thank you, thank you, thank you. I love sumo. A sumo wrestler should not only be strong but one who touches people's hearts by offering courage and hope through sumo." Meanwhile, Isegahama called the scandal a "mystery" and said he has never known his disciple to be one affected by alcohol. "I don't understand how this happened and it's very regrettable. But what happened happened. We can't blame anyone else but him (Harumafuji). I am truly sorry to the fans and members of the JSA. Please accept my deepest apologies," Isegahama said. Harumafuji, one of four wrestlers in the highest rank in the latest banzuke, does not have the option of retaining his membership in the JSA as a stablemaster as he does not have Japanese citizenship. Takanoiwa missed the Kyushu Grand Sumo Tournament that ended Sunday after being diagnosed with head injuries including a suspected fracture at the base of his skull and cerebrospinal fluid leak. He will also skip the winter regional tour that starts Dec. 3, the JSA said. Harumafuji was 86 kilograms (190 pounds) at the time of his first weigh-in as a 16-year-old, but he is now 137 kilograms (302 pounds), still one of the lightest in the sport's top division. In a similar case in 2010, yokozuna Asashoryu retired from the sport following allegations that he attacked a man outside a Tokyo nightclub in the middle of the New Year tournament. Takanohana intends to break his silence and cooperate with an investigation into the assault of a wrestler that cost Mongolian grand champion Harumafuji his career, the Japan Sumo Association said Thursday. But Takanohana, a former yokozuna on the JSA executive board, will only speak to the association’s crisis management team once police have finished their investigation of the incident, which occurred last month during a regional tour in Tottori Prefecture. A day after Harumafuji admitted to the assault and announced his retirement, Takanohana was called to Tokyo’s Ryogoku Kokugikan for Thursday’s association board meeting. After Harumafuji struck Takanoiwa during a late October night out in the city of Tottori, Takanohana filed a report with the local police. Since then, he has refused to cooperate with the JSA investigation. Takanohana, the sumo association leader of that tour, filed the police report without notifying the JSA. On Dec. 20, the crisis management team will issue a final report on the investigation at a meeting with the Yokozuna Deliberation Council and the JSA board, even though it has not yet finished questioning Takanoiwa. The punishment for Takanohana and Isegahama, who was Harumafuji’s stablemaster, will also be discussed at the meeting. Meanwhile, grand champion Hakuho and his stablemaster Miyagino were severely reprimanded Thursday by the JSA over Hakuho’s conduct following his 40th career championship win at the Kyushu Grand Sumo Tournament, which ended Sunday. Hakuho, who was present when the altercation occurred, stirred controversy by telling spectators during a championship interview that he wanted Harumafuji and Takanoiwa to return to the ring and called for a banzai cheer from the crowd, to which the spectators duly responded with three cheers. The injured Takanoiwa did not take part in the tournament while Harumafuji withdrew on the third day after the assault allegations first surfaced in the media. It was initially reported that Harumafuji hit Takanoiwa with a beer bottle, but the crisis management team now says he hit Takanoiwa with his palms, fists and a karaoke machine remote control. The team said Harumafuji had picked up a champagne bottle but did not use it to attack Takanoiwa as he lost his grip while swinging it. Harumafuji had apparently been angered by Takanoiwa attempting to use his smartphone while being scolded for his behavior by Hakuho. I'm glad to hear that Hakuho received a reprimand by the JSA. I wonder if his behaviour on Day 11 when he disrespected the gyoji played into any of their actions. Hakuho got let off far too lightly, at the very least he deserved a hefty fine. 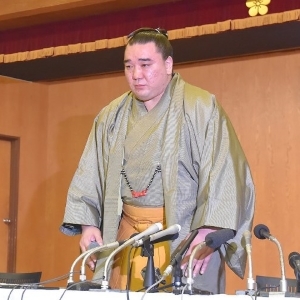 Sumo wrestler Takanoiwa filed a lawsuit seeking 24 million yen ($210,000) in damages from Harumafuji, claiming the former yokozuna’s assault last year forced him to miss matches due to injuries and caused him financial loss. Harumafuji faced a summary indictment in December for assaulting the lower-ranked fellow Mongolian wrestler with a remote control at a lounge bar in the city of Tottori on Oct. 26, causing injuries which took 12 days to heal. Harumafuji, who announced his resignation in November, avoided a trial and paid a fine of 500,000 yen. But Takanoiwa has been dissatisfied with the retired sumo champion’s way of handling the matter. The damages he now seeks include medical expenses and foregone salary, as well as benefits and bonuses he could have received had he been able to take part in matches, according to his lawyer. The civil lawsuit was filed just days after Harumafuji held a retirement ceremony. 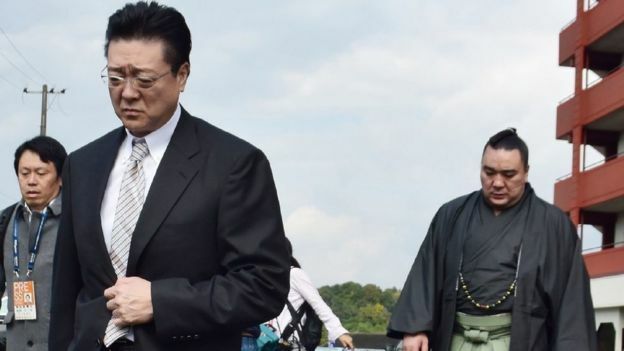 It also came after Takanohana, the master of the stable Takanoiwa belonged to, left the Japan Sumo Association, saying he could not accept the organization’s conclusion that his complaint over its handling of the assault was groundless. Takanoiwa and the former yokozuna first held talks concerning an out-of-court settlement late last year, but failed to reach an agreement. They again tried to settle at a summary court in August, but that effort failed as well. “Takanoiwa even considered his retirement at an initial stage,” said Toshiji Sato, his lawyer. Harumafuji had proposed paying 300,000 to 500,000 yen during the talks, according to the lawyer. A lawyer representing the former yokozuna, Tsugio Yada, declined to comment on the lawsuit, saying he has yet to go through the legal documents. Interesting. I guess it's just down to the number each side is willing to except. I thought this case had been sorted out, but evidently not.